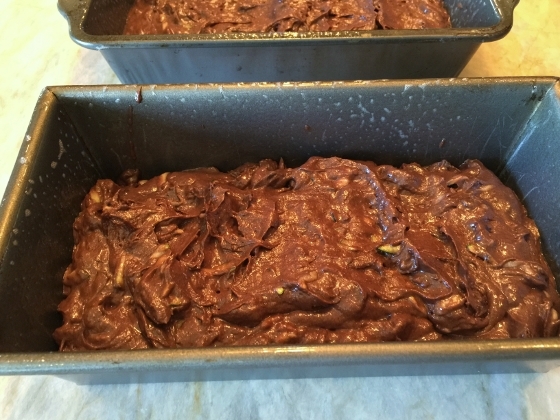 Double Chocolate Zucchini Loaves - Recipe! - Live. Love. Laugh. Food. 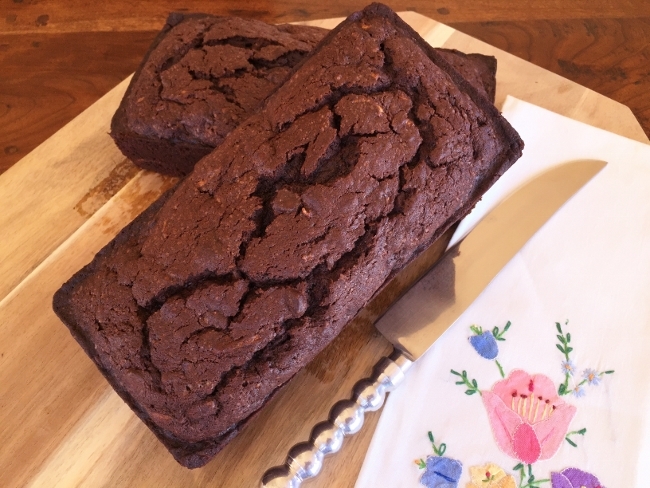 Zucchini bread is always a favorite and many of us have our own special recipe. I created this chocolate version for all the chocolate lovers out there, that can’t imagine eating anything sweet, without a bit of chocolate. The amazing chocolate flavors in these loaves enhance the quick bread, while the zucchini adds an extra moist crumb. 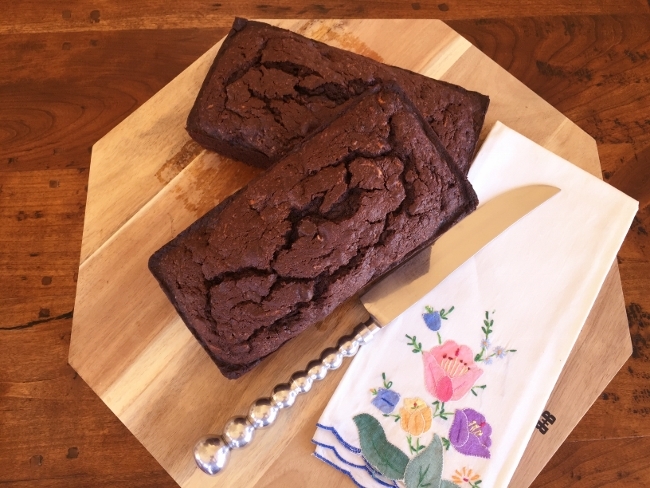 Cocoa powder is important in this recipe, because that’s what gives these loaves their special chocolate flavor. You know you have the right ingredients, when your house begins to smell like a miniature Willy Wonka’s Chocolate Factory, only better. These loaves are a delicious option for breakfast either toasted or warm right out of the oven – they’re also good with a schmear of cream cheese. 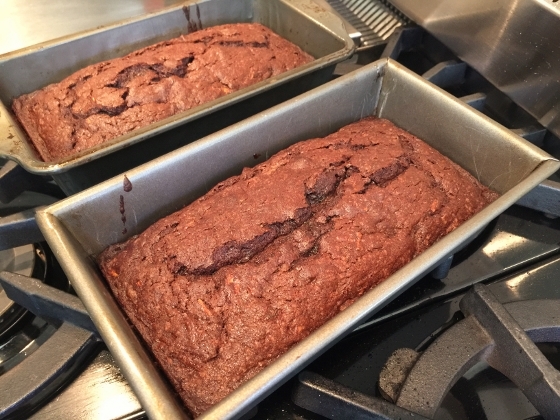 Double Chocolate Zucchini Loaves make a delightful dessert as well, especially served with a dollop of whipped cream or vanilla ice cream – you can even add some fresh berries. 1. Preheat the oven to 350 degrees. Grease 2 – 9 x 5 inch loaf pans. 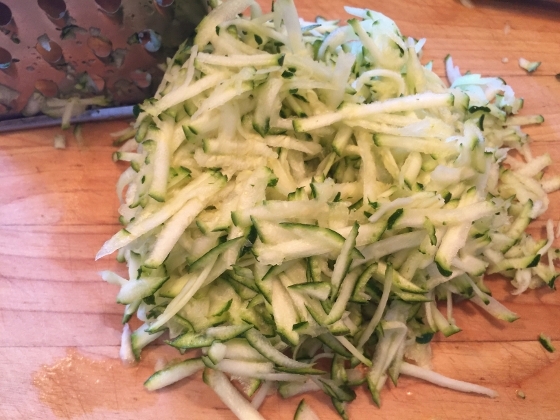 Grate zucchini on a box grater or in a food processor, reserve. 2. 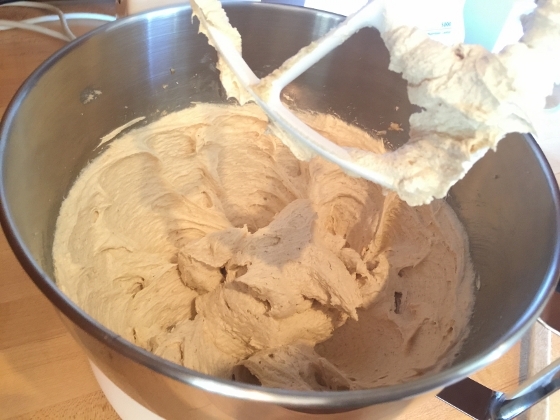 In a stand mixer, cream together on high speed, butter, olive oil and sugars for 4 minutes. 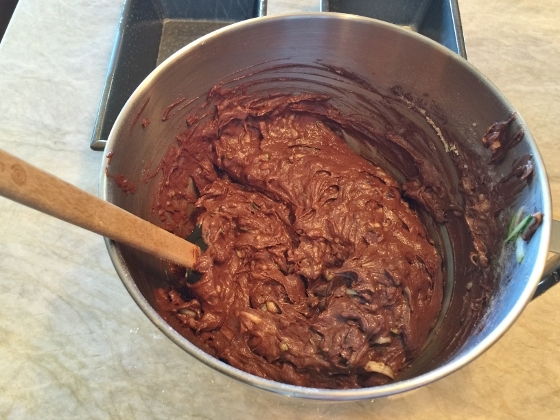 Using a rubber spatula, scrape down sides of bowl and add vanilla extract and eggs. Mix again on high speed for 3 minutes. 3. 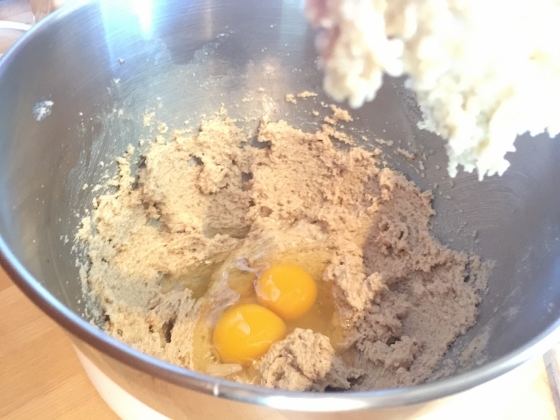 Next, add the 1 cup all purpose flour, whole wheat pastry flour, cocoa powder, baking powder, baking soda and salt. Mix on low speed for 30 seconds. 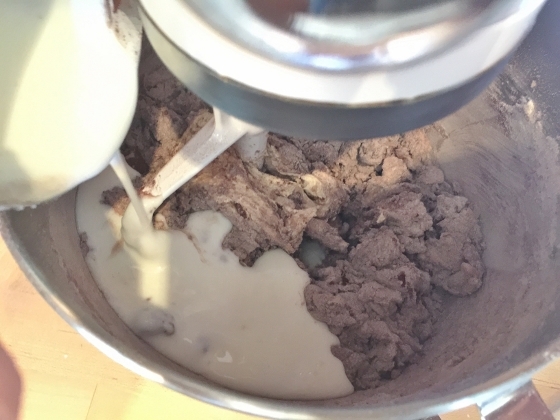 Then, add the buttermilk slowly to the batter, while mixing on low for 30 more seconds. 4. 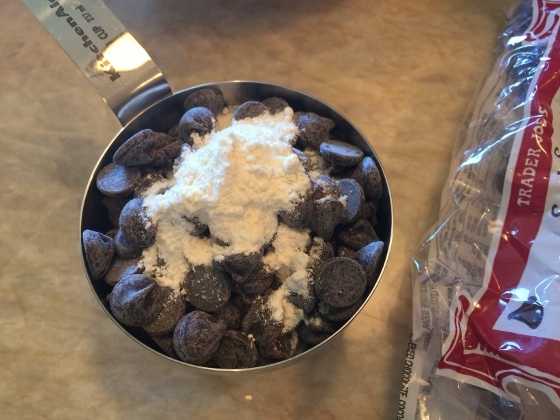 Measure out the chocolate chips and add the remaining 1 tablespoon of flour to them. Toss to coat in flour and add them to the batter. Mix on low speed for 30 seconds to combine. 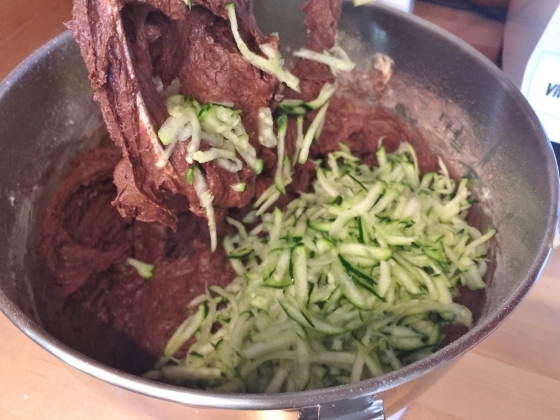 Then, add the zucchini and mix again for 1 minute until combined. 5. 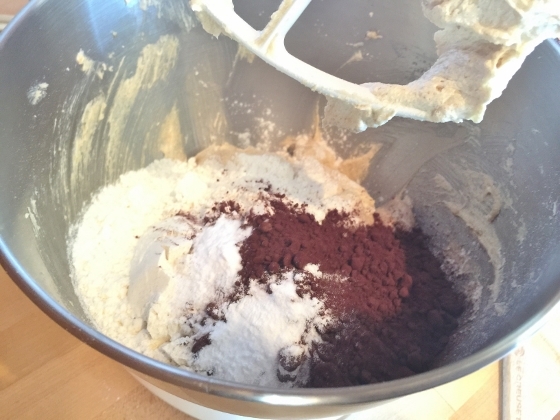 Remove the bowl from the mixer and stir by hand to make sure all the ingredients are incorporated. Spoon the batter into the prepared pans and bake for 50-60 minutes, or when a toothpick inserted, it comes clean. 6. Remove the loaves from the oven and let cool for 1 hour. Loosen the perimeter of the loaves with a table knife and invert onto a platter or board. 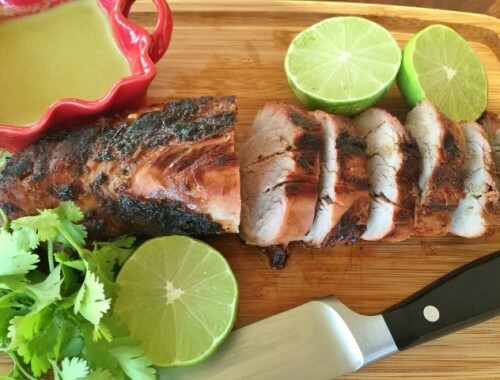 Serve immediately or wrap in plastic and store in the refrigerator up to 3 days. Enjoy! 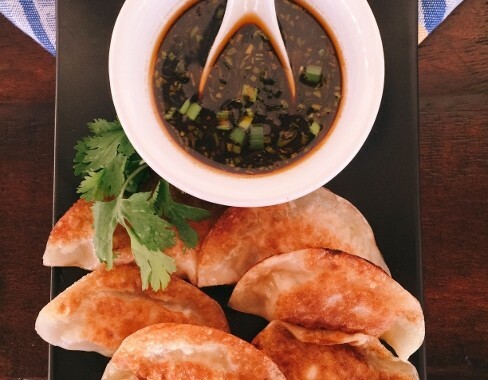 Spicy Shrimp Dumplings – Recipe! 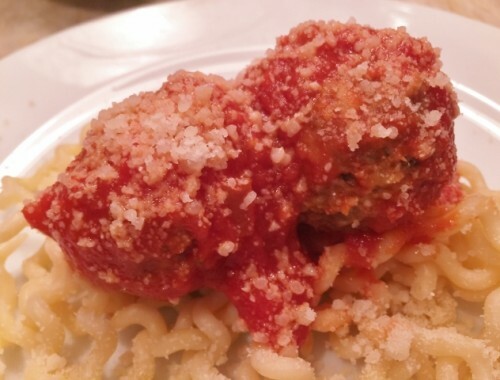 Mama’s Meatballs – Recipe! Authentic Italian Style!